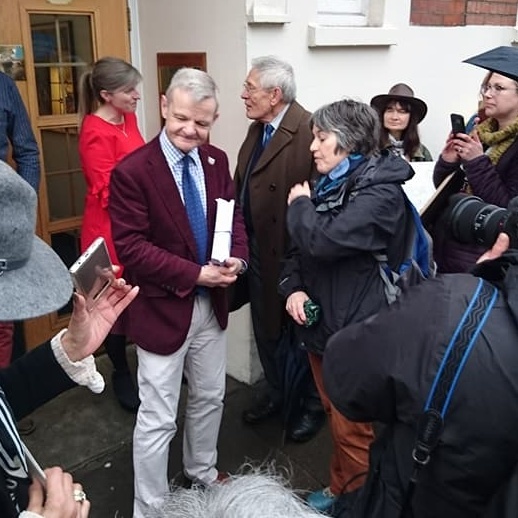 Around 1 O’clock on Monday 15th January the petition in support of veterinary homeopathy and other CAM was delivered into the hands of the president of the Royal College of Veterinary Surgeons Professor Stephen May, by junior-vice-president of BAHVS Ilse Pedler. The petition had attracted over 15,000 signatures (it's just over 16,000 as of Feb 1) and was accompanied on its journey, from the rendezvous point under Winston Churchill’s statue in Parliament Square to RCVS headquarters in Belgravia, by around 50 people (the maximum allowed without express permission from the police) and several dogs, some of whom were accompanied by their homeopathic medical histories, either on their coats or on banners. Several other banners were carried. 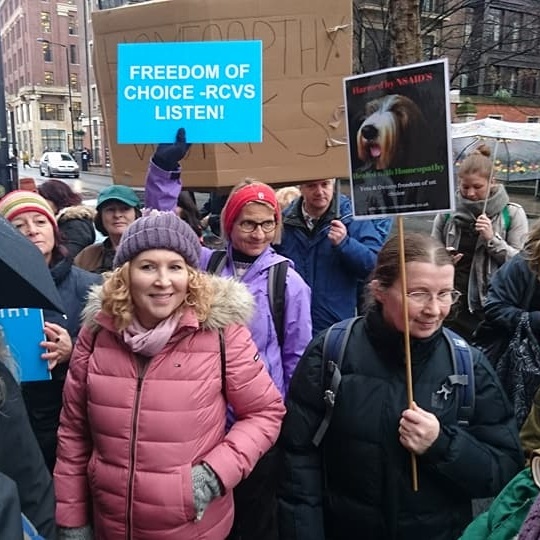 The majority of the marchers were animal owners, drawn from the ranks of the petition’s organisers, but supporting them were Chris Day, president of BAHVS and senior vice-president Jane Keogh, along with several other veterinary surgeons. Peter Gregory, the veterinary Dean, represented the Faculty, and CEO Cristal Sumner represented the BHA. Other delegates, from the HRI, SOH and Ainsworth’s homeopathic pharmacy, joined the throng. Despite the rain (which stopped by the time we reached Belgravia) spirits were high and vet Geoff Johnson led the chant ‘We want choices; hear our voices’. On reaching the headquarters of the RCVS in Belgravia House, there was some delay before the doors were opened and a representative came out to make the offer that some of the marchers should enter the building and have a cup of tea, but this was declined by the marchers, feeling it could be used as propaganda; after another delay the President appeared on the steps to receive the petition from Ilse Pedler with Chris Day in close attendance. Some dialogue ensued, led by a few very angry, but very polite pet owners, with a few words also exchanged between Professor May and Ilse and Chris. After some time the CEO Lizzie Lockett also appeared in support of her colleague. Both of these office holders looked extremely uncomfortable as might be expected. After around 20 minutes the doors were again closed, whereupon the crowd gathered in the park opposite for a last chant, and then repaired to a local pub. 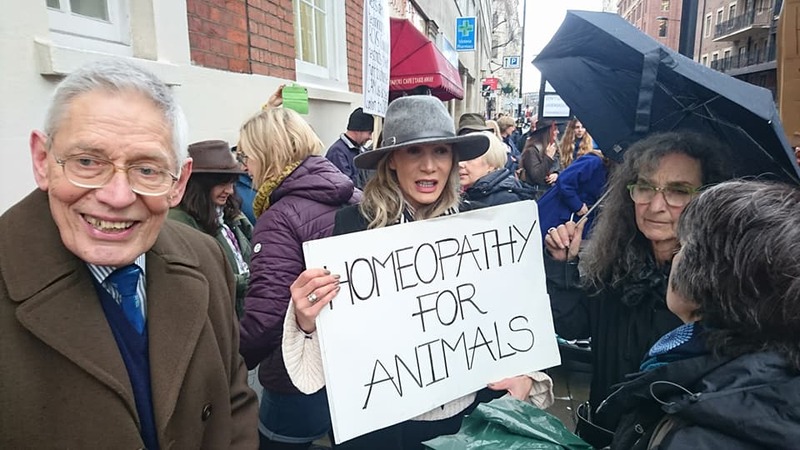 This is only the first move in what may turn out to be along campaign, but there is so much dedication and resolve among these animal owners they are positively awe inspiring and their campaign shows just how much support there is from the general public. To have this position statement rescinded will take a lot of work, but whenever the RCVS wishes to have a properly convened meeting the BAHVS and Faculty will be ready to negotiate. 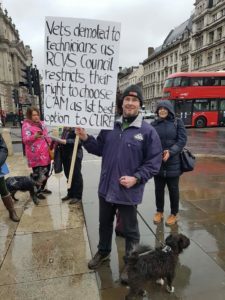 For the meantime one can only imagine that those at the interface between RCVS and the veterinary homeopathic world may be wishing their masters had carried out a proper consultation before drafting this ill-considered and poorly researched statement.